Play Abobo's Big Adventure on a Gamepad! PLAY ABOBO'S BIG ADVENTURE WITH A GAME PAD! While you can easily play Abobo's Big Adventure with a keyboard, the best way to play is with a gamepad so you can get the true classic gaming experience. While there's no way we can port this parody game tribute to a real console, we can show you how to easily hook up a gamepad controller to your USB port to give you the same classic gaming feel. First off, you need a gamepad, and for obvious reasons, we recommend a genuine NES controller. Normally, you wouldn't be able to simply plug these into your USB port, but there are plenty of places online that sell NES retrolink USB adapters for cheap. They plug right into your NES controller and convert the cable to USB. Nifty, huh? 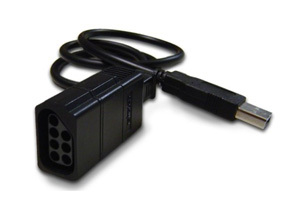 You can also buy a controller with a built in USB connector, but we strongly recommend getting the adapter and using a genuine NES controller instead. When we made the game, this is how we intended it to be played. Once you have your USB gamepad controller, you need to download a free program called Joy2Key in order to assign the proper keys to your gamepad so it will work with Abobo's Big Adventure. After you've installed Joy2Key, you'll need to plug in your controller, run the program, create a new configuration, and assign the proper keys to it. Once you've done all this, you should be able to play Abobo's Big Adventure in your browser using a gamepad! If your configuration isn't working, you can download our configuration file. Just be sure to save it in the same directory that your Joy2Key program is located in. If you're still having trouble getting your gamepad to work, there are lots of video tutorials on Youtube for how to configure Joy2Key with a NES controller that may help you out.